Acuity Cloud Solutions has demonstrated skills and experience to achieve the Gold Partner Cloud Standard designation within the OPN Cloud program. Oracle Cloud is the industry’s broadest and most complete public cloud, delivering enterprise-grade services at every level of the cloud technology stack including software as a service (SaaS), platform as a service (PaaS), infrastructure as a service (IaaS), and data as a service (DaaS). Additionally, Acuity has achieved the Cloud Excellence Implementer (CEI) Certification for HCM Cloud in the Core Human Resources module. The program recognizes partners who continually demonstrate expertise, a successful track record and customer satisfaction in delivering high-quality Oracle SaaS Cloud implementations. Consultant certifications, ongoing training and verified customer surveys are a part of the criteria for certification. Acuity’s sales team is certified in both pre-sales and sales for Oracle Taleo Acquisition Cloud (OTAC) and HCM Cloud and we are positioned and experienced to sell these products. 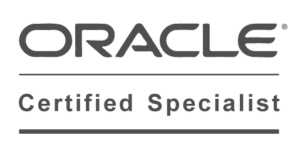 We have invested time and effort into obtaining these certifications to demonstrate our commitment to and understanding of the Oracle products we service for our clients. Additionally, each Acuity consultant is expected to test and pass the Oracle Implementation Certification for the product they service. At least 95% of our consulting group holds these certifications and has demonstrated superior implementation success. Acuity is registered with the System for Award Management (SAM), an official U.S government system that consolidates the capabilities of Central Contractor Registration (CCR)/FedReg, Online Representations and Certifications Application (ORCA), and Excluded Parties List System (EPLS). Both current and potential government vendors are required to register in SAM in order to be awarded contracts by the Government and are renewed annually. Acuity is a self-certified Women-Owned Small Business (WOSB) with the Small Business Association and is a 100% women owned and managed company. The SBA’s WOSB Federal Contract Program provides greater access to federal contracting opportunities for WOSBs. The Program allows contracting officers to set aside specific contracts for certified WOSBs and will help federal agencies achieve the existing statutory goal of five percent of federal contracting dollars being awarded to WOSBs. Acuity is certified by WBENC (Women’s Business Enterprise National Council) as a woman-owned business in the United States. The WBENC certification provides many opportunities, including the freedom to align ourselves with clients who have an interest or obligation to have a diverse vendor list.